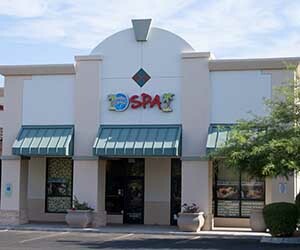 Our first Scottsdale day spa originally opened in 2007 a few blocks away from its current location. Due to our growing business we needed a large facility in a few years so we relocated to this current location in 2011. All of our spas are privately owned by the Ibach family who founded the Hawaiian Experience Spa concept (read more about us) in 2007. Our Scottsdale, AZ location is over 2,400 square feet and with massage rooms, a facial room, couples’ massage rooms, two exotic showers (big enough for two in case you bring a partner), a relaxing lounge, a complimentary tiki bar, and much more. Please feel free to stop in for a tour anytime! Aloha. #1 Day Spa In Scottsdale, AZ! Come experience the difference for yourself. Directions: GPS systems often send people to the opposite corner! Please follow these directions or see the map below. Take route 101 to the Shea Blvd. Exit. Take Shea Blvd. east until you reach Frank Llyod Wright (which is also 114th St). Turn left on Frank Lloyd Wright and go to the first light which is Via Linda. Go through the light and make an immediate right turn into the Walgreens parking lot. Drive past Walgreens and you will see us! Our Scottsdale day spa is convenient to Fountain Hills, Paradise Valley, Cave Creek, Phoenix and other area Arizona cities. We have great career opportunities for experienced and entry level massage therapists in Scottsdale. Visit our Scottsdale Massage Career page for more information on working as a massage therapist in our Scottsdale day spa.
" “The best spa in the west! I’ve been looking high and low for a spa for body scrubs and massages. I am so glad I found the Hawaiian Experience.” "
" “This spa has worked wonders for me and my wife. We stumbled upon it and feel like we found a hidden gem in the middle of the desert. The therapists there have worked wonders for the both of us and we look forward to many years to come of their service.” "
" “My husband and I were on vacation in Scottsdale and decided to get a lomi lomi massage. We had never had that type of massage before. It was incredible! It was very relaxing and therapists were fantastic. We left feeling relaxed and our sore muscles were a thing of the past. Everyone there is really nice and makes you feel at home.” "